Published: Jul 2018 i Previous editions(s) can be found in the Related Items tab. G. "Warren" Whitaker assists high net worth individuals and multinational families with complex domestic and international estate planning and related income tax, corporate and personal financial planning. Clients seek his experience with sophisticated international transactions; trust and estate issues, both domestic and international; family office needs; and trust services and fiduciary compliance. He is a member of the firm's Executive Board. Warren is a prolific writer and international speaker. Since 2003, he has been published or cited nearly 80 times in respected news sources, such as Bloomberg, The New York Times and Worth Magazine. Warren wrote one of the standard references in his field, Estate Planning for Foreign Persons, Trusts, and Assets, and co-authored the United States sections of Tottel's Succession Law and Bloomsbury's International Succession Laws. He has also served in variety of leadership roles in his professional community, including serving as U.S. chair of the U.K.-based Society of Trusts and Estates Practitioners (STEP), member of the STEP Worldwide Council and chair of the Trusts and Estates Law Section of the New York State Bar Association, as well as the Section's International Estate Planning Committee and Estate Administration Committee and a former district representative. Among his honors and recognitions is selection as a fellow of the prestigious American College of Trusts and Estates Counsel (ACTEC) and its International Estate Planning Committee. For years, Warren's peers have named him to lists of top lawyers. 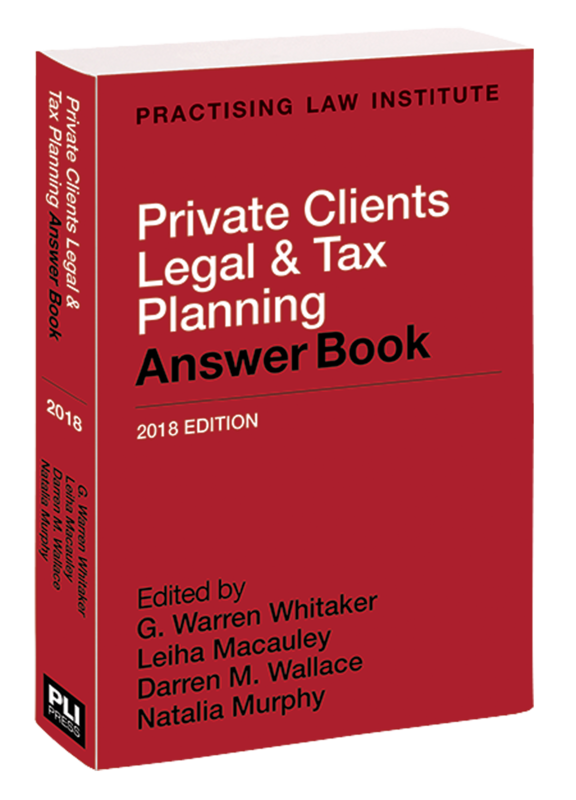 As Chambers USA described him, "Warren Whitaker is the leading figure in the practice and is sought by clients for 'his depth of experience and intellect, and his very good grasp of cross-border taxation.'" Worth Magazine has named Warren as one of the nation's 100 Top Wealth Advisors. He also speaks French. According to the 2013 edition of Chambers USA, clients note Leiha is "'incredibly energetic and has branched into all aspects of the practice.'" Leiha Macauley received the 2011 Lelia Josephine Robinson Award from the Boston University School of Law Women's Law Association. The award, named for the first woman admitted to practice law in Massachusetts, honors exemplary leadership in one's community. Darren Wallace, resident in the firm's Stamford office, is a partner in the Individual Clients Department. His experience includes advising clients regarding all aspects of estate planning, estate and trust administration, estate and gift taxation, and probate and trust litigation. Darren received a B.A. from Colgate University and a J.D. from the University of Connecticut School of Law. He is a member of both the Tax and the Estates and Probate Sections of the Connecticut Bar Association, and a member of the executive committee of the Estates and Probate Section. Darren is a former co-chair of the Estates, Probate, and Tax Committee and a former member of the executive committee for the Young Lawyers Section of the Connecticut Bar Association. Darren is also a member of the Fairfield County Bar Association and the Estate Planning Council of Lower Fairfield County. His community activities have included service on the board of directors for PLAN of Connecticut, Inc., a nonprofit organization that assists in planning for the future of family members with disabilities and provides continuity of services for such individuals. He is a co-author of "How FLPs Can Survive IRS Scrutiny," Financial Advisor, September 2004; "Planning for Property Interests in More Than One State after the Demise of the State Death Tax Credit," Probate & Property, Vol. 18, No. 5, September/October 2004; "Get Real or Get Out," Trusts & Estates Magazine, July 2003; and "A Client's Death Doesn't Mean All Planning Must Rest in Peace: Qualified Disclaimers and Other Keys to Post-Mortem Planning Opportunities," Probate & Property, Vol. 17, No. 3, May/June 2003. He has also lectured at programs for the Connecticut and American Bar Associations. In 2005, Darren received the New Leaders of the Law "Advocacy Award," presented by The Connecticut Law Tribune. Darren lives in Fairfield, CT, with his wife Marianne and their daughters Catherine, Sarah, and Hannah.